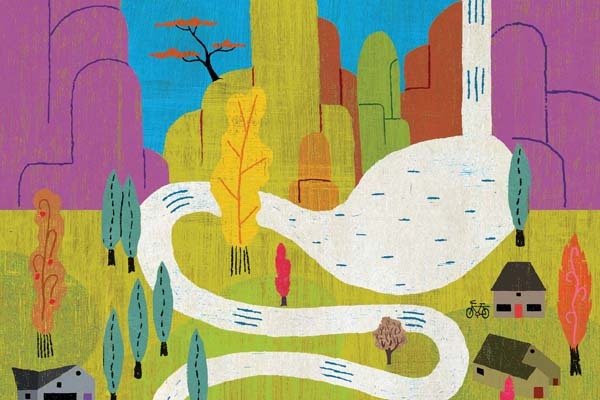 When James Goldenring, MD, PhD, talks about the landscape of the stomach, he sounds a bit like a real estate agent: this is a desirable neighborhood, this one is a bit sketchy, and by all means, steer clear of this area. In the case of the stomach, these “neighborhoods” are collections of different types of cells and microbial residents that comprise the normal stomach versus stomach tissue that is on its way to becoming a gastric cancer. That transition of stomach regions — from normal to injured to precancerous to gastric cancer — has been the focus of Goldenring’s research career. “We’re most interested in the precancerous neighborhood and the cells and factors that are pushing it to progress to cancer,” says Goldenring, Paul W. Sanger Professor of Experimental Surgery. Goldenring and other investigators at Vanderbilt, working with international collaborators, are attempting to do exactly that — to halt the progression toward stomach cancer, or better yet, to reverse it. Their efforts are unique. “Trials targeting pre-cancer are rare,” says Goldenring. The studies build on decades of basic science and pre-clinical studies of gastric cancer development using cell culture and animal models. “We have a very broad group of investigators with deep expertise working on gastric cancer,” says Richard Peek Jr., MD, Mina Cobb Wallace Professor of Immunology and director of the Division of Gastroenterology. Stomach cancer is a leading killer worldwide. It is more common in eastern Asia, Latin America and Eastern Europe than elsewhere, and although the number of new gastric cancer cases in the United States has been declining over the last century, evidence suggests it may now be on the rise. The number one risk factor for stomach cancer is infection with the bacterium Helicobacter pylori. When H. pylori moves in, the stomach neighborhood changes. The twisty, sausage-shaped bug uses one to five flagella — whiplike appendages — to burrow into the stomach lining, where it interacts with epithelial cells. H. pylori is most commonly transmitted person-to-person, and in regions of the world with crowded conditions and poor sanitation, H. pylori infection rates are higher. The Helicobacter pylori uses its whiplike appendages to burrow into the stomach lining. Image by istockphoto.com. H. pylori causes chronic inflammation (gastritis) and contributes to the development of ulcers and stomach cancer. Only a fraction of those infected — about 1 percent — will develop gastric cancer. Vanderbilt investigators are studying the complex factors that lead from H. pylori infection to inflammation, cellular changes and cancer. 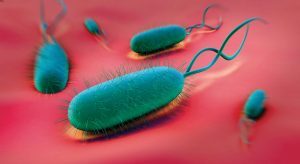 “The drivers are a ‘Bermuda Triangle’ of H. pylori genetics and responses, the host’s genetics and inflammatory responses, and how these pathways are modulated by diet and environment,” says Douglas Morgan, MD, MPH, associate professor of Medicine. In other words, even though an infection is causing cancer, it’s not feasible to simply treat every infected individual with antibiotics to prevent cancer. Evidence suggests that antibiotic treatment in the precancerous stage does not prevent the transition to cancer in most individuals. And H. pylori may actually be beneficial in some people. “Most people in the world who have the bug have no symptoms; they don’t get ulcers or cancer, so maybe there’s a reason for that bug to be there,” Goldenring says. In studies of esophageal disease, however, Peek and his colleagues found the opposite. “The presence of H. pylori in the stomach actually was inversely associated with the development of disease in the esophagus,” he says. H. pylori infection is also inversely related to allergic diseases including asthma and atopic dermatitis and to inflammatory bowel disease. In parts of the world where H. pylori infection rates are decreasing, including the United States, these diseases are increasing. Dietary and environmental factors may push H. pylori toward being more oncogenic, Peek says. Peek and his colleagues have demonstrated that animals that are iron-deficient are twice as likely to develop stomach cancer when they are infected with H. pylori, compared to animals with normal iron levels. They found that iron deficiency allows the bacteria to inject more of an oncoprotein called CagA into host epithelial cells. Timothy Cover, MD, professor of Medicine, and his team have shown that high salt concentrations increase the production of CagA and the risk of gastric cancer. In recent studies of bacterial strains isolated from patients in Latin America, a region with high rates of gastric cancer, the investigators have identified a specific salt-responsive region of DNA that promotes the production of CagA. “I think this is a breakthrough as far as linking dietary influences to bacterial pathogenesis,” Peek says. Keith T. Wilson, MD, has vivid memories of the experiment that set in motion two decades of research in his laboratory, and which has now culminated in a gastric cancer prevention trial in Latin America. It was the early 1990s, and Wilson was a new faculty member at the University of Maryland with an interest in the signaling molecule nitric oxide, H. pylori, and gastrointestinal immunology and inflammation. 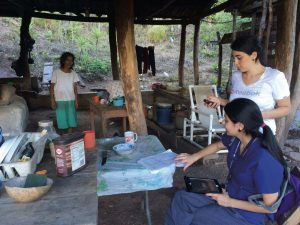 Vanderbilt researchers have been studying bacterial strains of H. pylori isolated from patients in rural Latin America, a region with high rates of gastric cancer. In the lab, he added H. pylori to gastric epithelial cells and looked for nitric oxide. There wasn’t any. Then he looked for nitric oxide after adding H. pylori to cultured macrophages, white blood cells that patrol the body for infection. In the test, the presence of nitric oxide is revealed by a magenta color. Wilson and his colleagues began using cell cultures to explore the enzymatic pathways that produce nitric oxide and alternative products. Their studies led them to molecules called polyamines, which are produced by the enzyme ornithine decarboxylase (ODC) and which have been shown to be both detrimental and beneficial to cells, depending on the context. They found that H. pylori infection induced ODC in macrophages, and that ODC was increased in tissues from H. pylori-infected mice and humans. Looking further along the pathway at the enzyme spermine oxidase, which metabolizes polyamines, they discovered that it also was increased in response to infection with H. pylori. Spermine oxidase produces hydrogen peroxide, a chemical associated with oxidative stress and DNA damage. Using H. pylori strains isolated from patients in regions of Colombia with high and low risks of stomach cancer, Wilson and his team found that high-risk strains induced higher levels of spermine oxidase and cause more cancer in a gerbil model, compared to low-risk strains. Ultimately, the investigators showed that blocking either ODC or spermine oxidase reduced carcinogenic responses in cultured cells and reduced cancer in H. pylori-infected gerbils. “Starting with me adding H. pylori to macrophages, we’ve built this compelling narrative about polyamines, the enzymes that produce and metabolize them, oxidative stress and gastric cancer,” Wilson says. Based on the promising cancer reduction in gerbils, Wilson and Morgan were awarded funding from the National Cancer Institute to conduct a chemoprevention trial in Honduras and Puerto Rico. They are testing DFMO, an ODC inhibitor that is approved for African sleeping sickness. Patients with pre-malignant lesions in the stomach (intestinal metaplasia), as determined by endoscopy, may enroll in the trial and receive DFMO. Patients will have follow-up endoscopies at 6 and 18 months, and the investigators will examine biopsies for DNA damage and histology. Metaplasia is a change in cell type: from one mature type to another. Goldenring and his colleagues have been focused on a particular type of metaplasia in the stomach — the change of chief cells, which produce digestive enzymes, into mucus-secreting cells they call SPEM. 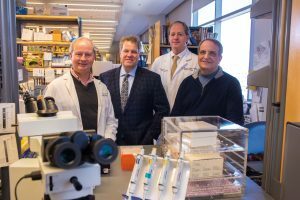 From left, Richard Peek, Jr., MD, Keith T. Wilson, MD, Douglas Morgan, MD, MPH, and James Goldenring, MD, PhD, are leading efforts on multiple fronts internationally to prevent gastric cancer. Photo by Anne Rayner. “Our findings had been controversial for many years because we were proposing that cancer in the stomach started not from the progenitor cells that produce all the cells that normally line the stomach, but from a transdifferentiation of chief cells,” Goldenring says. What starts as a protective response (mucus coats cells to allow healing), under the influence of continued inflammation, can turn into intestinal metaplasia, a step in the cascade of precancerous stomach lesions characterized by Pelayo Correa, MD, professor of Medicine, emeritus. “It’s the transition to intestinal metaplasia that represents the precancerous neighborhood,” Goldenring says. Eunyoung Choi, PhD, assistant professor of Surgery, targeted an activated pro-growth signaling molecule called Ras into the chief cells in mice and was able to trigger the entire cascade: from chief cells to SPEM to intestinal metaplasia. Then the investigators tried blocking the Ras signaling pathway with the drug selumetinib in animals with precancerous intestinal metaplasia. They found that the progression of metaplasia was halted and that normal stomach cells repopulated the stomach. “This was a complete surprise,” Goldenring says. “Somehow the treatment ‘woke up’ the production of normal stomach cells; it wasn’t that the metaplastic cells were turning back into normal cells. Goldenring and his colleagues have also treated H. pylori-infected gerbils that have metaplasia with selumetinib. Without any eradication of the bacteria, they found an arrest of the metaplasia and a return of the normal stomach cells. Goldenring is working with collaborators in South Korea to test selumetinib in patients following endoscopic resection of stage I gastric cancer. “Gastric cancer evolves in a field of metaplasia, and it’s a big field. Sometimes, especially in places like South Korea where H. pylori infection is endemic, the whole stomach is replaced with metaplasia,” Goldenring says. Patients who have a stage I gastric cancer removed and are treated with antibiotics to clear the H. pylori infection still have a 2 to 5 percent incidence of gastric cancer recurrence per year — 20 to 50 percent over 10 years. Douglas Morgan, MD, MPH, started working in Honduras after college as a Peace Corps engineer. He returned — after training in public health and gastroenterology — as a physician. In the trial, co-sponsored by Astra-Zeneca, treated patients will have follow-up endoscopies, which are the standard-of-care in South Korea, and investigators will examine biopsy samples for a change in the metaplasia and a return of normal stomach lineages. Goldenring argues that the lessons learned about the development of stomach cancer will have broad relevance for multiple types of cancer. “Gastric cancer is the model for inflammation-driven cancer,” he says. “We know the initial insult (H. pylori) and its impact to cause inflammation. We have access to plenty of tissue for analysis, and we have great animal models.